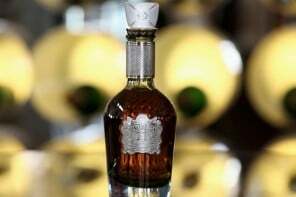 Chivas Regal and Globe-Trotter have once again renewed their vows. 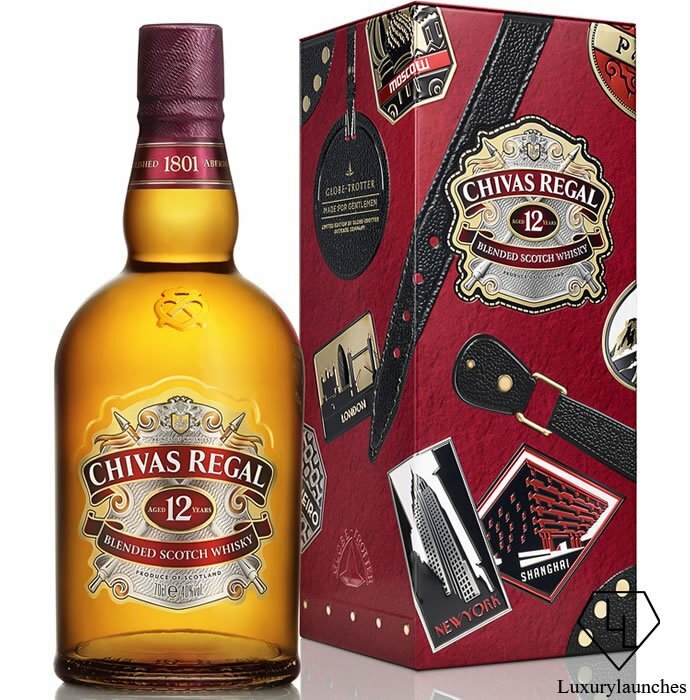 A heavenly collaboration made on earth to satisfy the luxurious hunger of an opulent traveller – that is how the Chivas 12 ‘Made for Gentlemen’ by Globe-Trotter – can be described in a nut-shell. Oozing traditional handcrafting luxury, style, convenience and class, three collectibles are being launched – the Chivas 12 ‘Made for Gentlemen’ by Globe-Trotter limited edition gift tin, a limited run of Chivas 12 ‘Made for Gentlemen’ by Globe-Trotter 20 inch Carry-on Cases and a Chivas 12 ‘Made for Gentlemen’ by Globe-Trotter Steamer Trunk. Like in the quaint old days, the boxes features luggage stickers to showcase countries travelled hand drawn by British illustrator Andrew Davidson highlighting ‘iconic cities and contemporary tin design’. While it used to be a matter of pride in the good’ole days, these days the stickers are more vanity than a display of places travelled. No tin box could contain all the trips a person accumulates a year these days, forget a decade or lifetime. The 20 inch trolley case has been crafted in a way that it can be stowed in the flight cabin of all international airlines, and is an elegant companion for a business traveller or a leisure one. 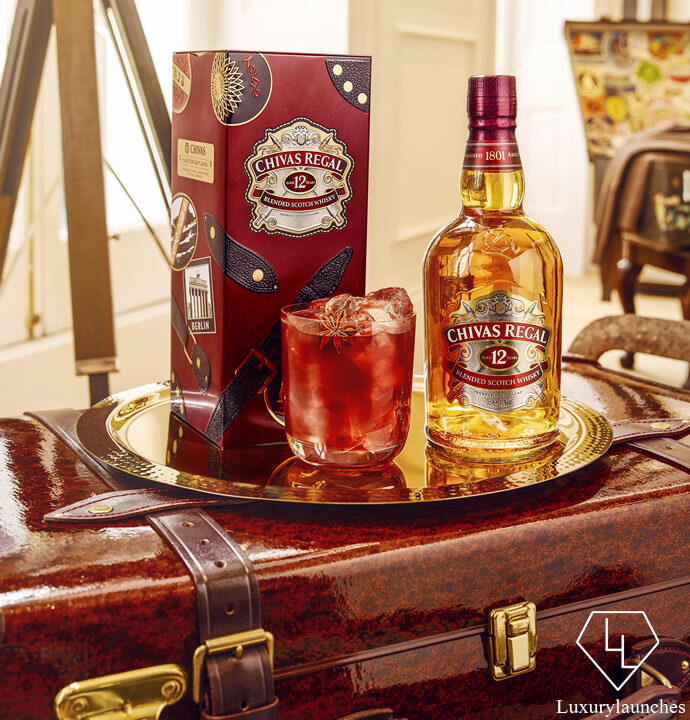 The sturdy, burgundy, vulcanised fibreboard case features a customised lining featuring a Globe-Trotter archive design with the Chivas iconic signifier and also wooden handles, brushed brass hardware and an internal leather plaque. The gem of the trio is obviously the Streamer Trunk. Following in line with the similar exteriors of the other two, the interiors will make any gentleman of today swoon in enchantment. 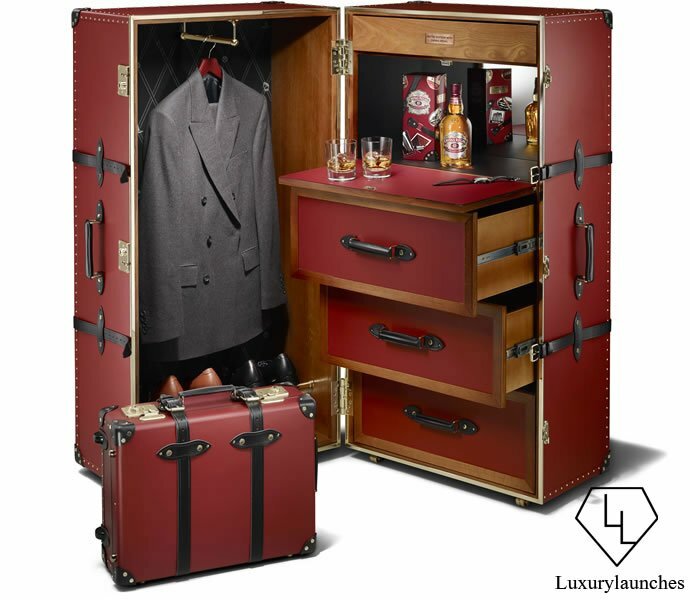 It will feature a beautifully crafted mini bar with mirrored back for serving Chivas Regal Scotch whisky, compartments for shoes, a drawer to hold up to eight watches, leather covered hangers to hold suits. The drawers are made of American white oak trimmings. The trunk comes with a deservedly high price tag of $18,800, with proceeds of its sale donated to The Prince’s Trust charity. 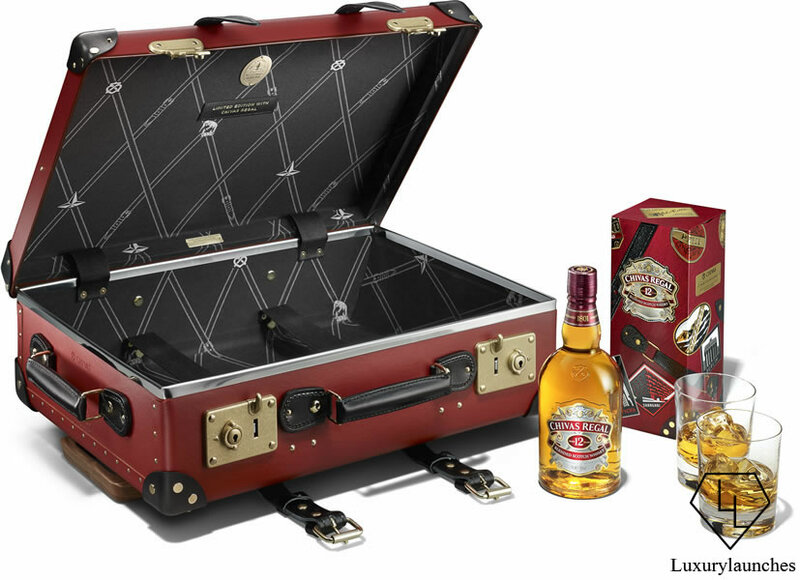 The gift tin and carry-on case will cost $45 and $1,490 respectively. The series will be on sale only till the end of this year, to mark the exclusivity of such a possession and makes for an ideal Christmas gift for the class-loving man in your life – father, husband, brother, son etc; and will be on display from October 5 at the Globe-Trotter’s flagship store in Albemarle Street, London. 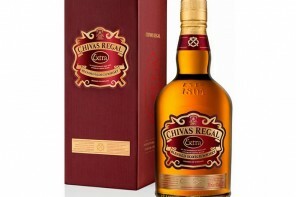 Cheers – Chivas Regal debuts Chivas Regal Extra- their first new blend in almost 8 years!